(CHICAGO, IL, 11/24/10) -- The Chicago office of the Council on American-Islamic Relations yesterday filed a discrimination lawsuit in federal court on behalf of 49 Muslims of Somali heritage who were fired from a meat packing plant in Nebraska. The lawsuit intervenes in a class action filed by the Equal Employment Opportunity Commission (EEOC) in August on behalf of more than 200 Somali factory workers from the Swift Co. plant in Grand Island, Nebraska. 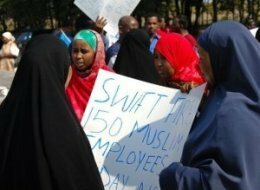 After a year-long investigation into the complaints, the EEOC determined "such accommodation would not have posed an undue hardship to [Swift]" and that the evidence further establishes that Swift's supervisors "subjected Somali Muslim Employees to unlawful harassment, disparate treatment, and discrimination in terms and conditions of employment based on their religion, national origin, race, and color." The EEOC also confirmed that some employees were unlawfully terminated in retaliation for their requests for religious accommodation. In a statement, CAIR-Chicago Civil Rights Director Christina Abraham said: "These employees worked hard and did not ask for special treatment. All workers are granted short breaks. Supervisors at the plant, however, did not like that breaks were used to perform Islamic prayers. Everyone deserves to be able to earn a living without sacrificing their beliefs to put food on the table."